Planning future interior or repair are often no less important process than its embodiment in life. Therefore, we must approach it with special attention to avoid future surprises. You can trust the professional designer or not, or can do it on your own. In that case, you do not even require the traditional pen and paper to create sketches and plans. 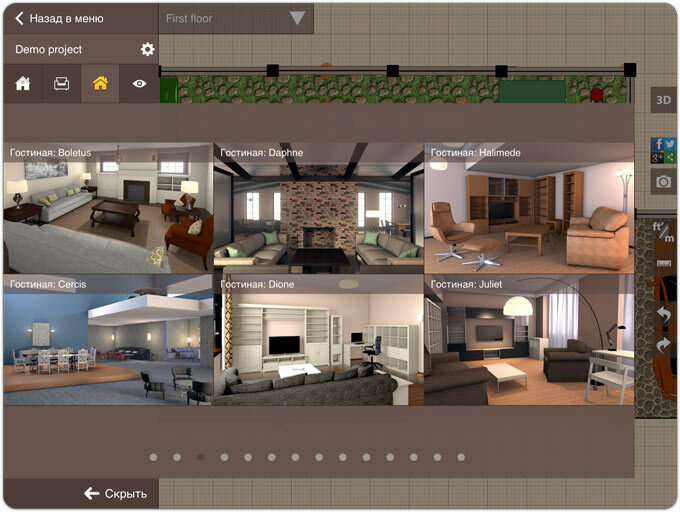 The thing is that you can now easily create a three-dimensional model of the interior with iPad Apps Planner 5D. Looking ahead, design space of your dreams has never been so easy. So, you already have in mind a clear (or maybe not) detailed picture of what you want to create: a separate room, apartment, house or plot about it, but you do not know how to do it better. 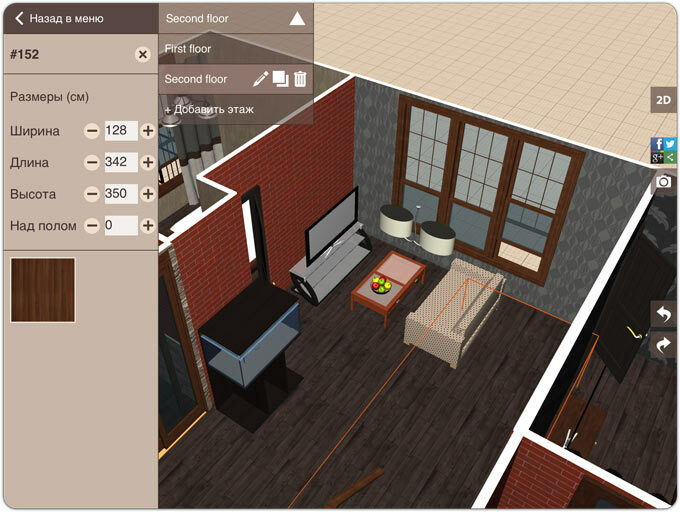 To begin, download Planner 5D in the App Store for free and create an account, and we will get acquainted with the possibilities of the application by creating a new interior. But first let’s tell you about a very interesting function — synchronazing projects with the server. You need to create an account for these purposes. Than you can view and edit your iPad projects in web — planner5d.com — and sync with other iPad as well. To unload the project from the tablet to the network make a swipe down from the main menu and all plans will go to the cloud. To demonstrate the capabilities of the application there is an example of ready-made design that clearly illustrates how a rich set of tools and extensive customization project. But try to create something, running a new project. Initially, we have one room 5×5 meters, around which you can begin to create your plan. To change the size of the room it enough to touch one of the corners and then drag it to the desired direction. You can add all the other objects from the menu on the left side. At first it is better to create a complete copy of the virtual space which will be renovated. So feel free to sway from the sidebar new rooms, change their size, and then supplement plan doors and windows. But the doors and windows — this is only the tip of the iceberg. 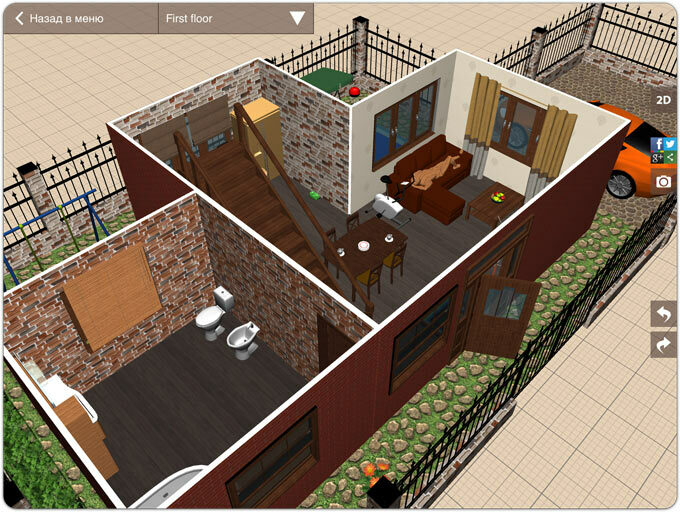 Planner 5D has lots of other facilities: arches, walls, stairs, columns, gates and even fences. Flight of fancy is almost unlimited. Creating a framework, you can proceed to the next step: choose the color and texture of the walls, floor, ceiling. 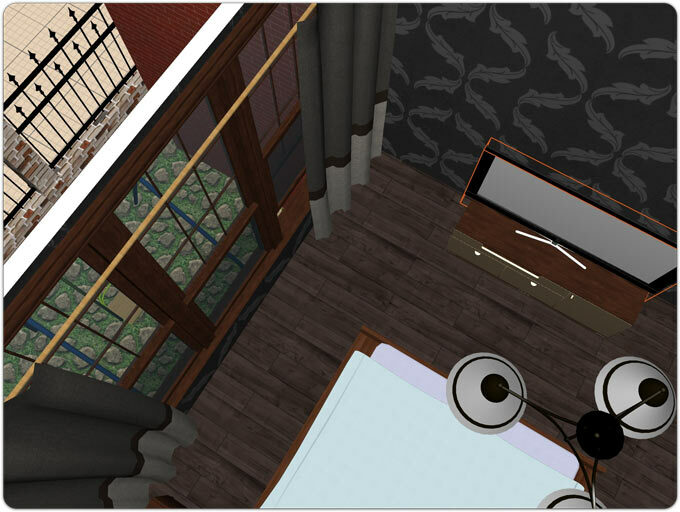 Planner 5D opportunities allows in a couple of touches change the height of the ceiling or any object. Suffice it to touch him on the plan by selecting the object and then specify its properties in a special menu. For easy navigation, you can assign each room its name, then to switch easily between rooms simple touch. To switch between floors using the pull-down menu. Built from virtual house go directly to the creation of the interior. Here we see four large sections. furniture, appliances, and other exterior allowed to place on the virtual plane home every detail, down to the food bowls for your pet. This attention to detail is good. But there are few restrictions. Choose, for example, for living room sofas. Several of them can safely drag into your project, but others are marked with the house, meaning that just as coveted piece of furniture in the plan will not be able to see. Since Planner 5D is free, then some of the objects are available by subscription. Open access to the entire catalog can be a week, a month or forever. Accordingly, different prices and from 99 to 329 rubles. But it should digress. It is unlikely you will be doing repairs every month, and therefore can be limited to a weekly subscription to take advantage of all the features of the program. If you plan to use Planner 5D as a working tool, the approach here unlimited access. In other words, the pricing is quite flexible and is suitable for most users. Anyway, but you gradually fill your project or home furnishings landscape. Surprisingly, any object within a project, you can change whatever you like. Do you want to increase the size of the chair? Easily. Color? No problem. In the end, you can always create an exact duplicate of any object. Of course, you can edit color too. The best part for last. Whatever was not your perfect plan, but in the plane he does not look as realistic as it should be in real life. Specifically for this purpose press key 3D right and see your project is fully three-dimensional. Virtual tour of the apartment or house will not only admire their works at a different angle, but generally take a look at the new plan developed. After such review will certainly fresh ideas at the expense of what you can do to fix or better. Three-dimensional picture almost flawless. Distressed only strange kind of stairs, if you look at it from the top floor. But on the other hand, it’s still not The Sims, so this little thing can easily forgive Planner 5D. 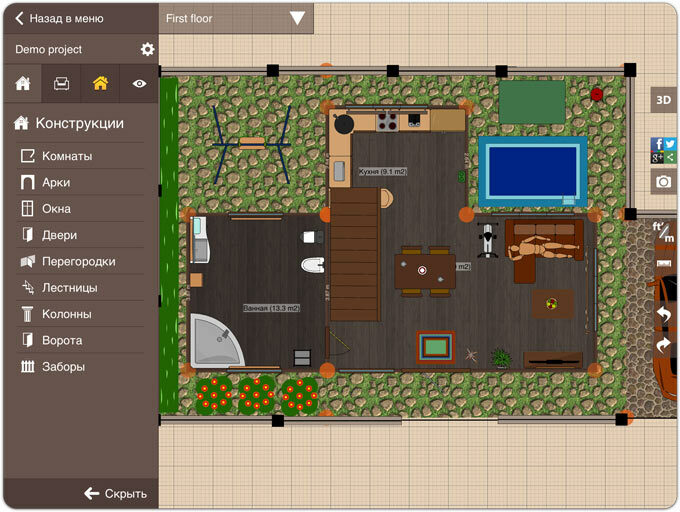 Planner 5D — a unique solution for the interior design and landscape, and not focused on professionals (although they, too, will be interesting) , and ordinary users, is going to take the appearance of their homes. On the credit application easy tools for making facilities as well as a myriad variety of items to fill them. And so the 3D mode and did a great opportunity to present the first look at the future design. For such an application was not sorry and would pay, and it is distributed free.